So, after all of this cooking, and especially after W does the cooking, at some point I have to get the dishes done. If I was super organized, I would empty the dishwasher first thing in the morning and load my dirty dishes into the dishwasher as they arrive during the day. Well, that doesn’t always happen, actually it rarely happens, but eventually I have to empty and re-load the dishwasher. So, why not add it to my exercise arsenal? As I get older, I find that bending over is getting more and more painful. I’ve got a right hip that screams at me every time I bend over, so instead, I squat down rather than bend at the waist. Now, I know this might be hard for folks that have bad knees, so if that’s the case, this one might not work for you. Or, let me know if you have a modification to this exercise that makes it easier on the knees. So, if you are able to, instead of bending at the waist to pick up those plates and bowls and such out of the lower rack of the dishwasher, try squatting down instead. Just keep your back straight, abs tight (always engage the abs no matter what you’re doing), bend your knees, and grab that plate. Straighten up and stretch your arm up high as you put it away. Do it again until you’ve emptied the dishwasher. And, if you’re really ambitious, load the dishwasher now, too. 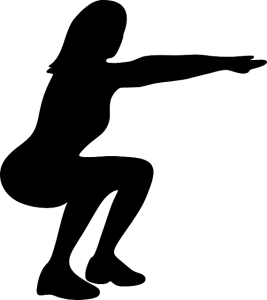 Same sequence: bend your knees, engage the abs, and place that dirty plate or bowl into the bottom rack of the dishwasher. This also works for picking up laundry off the floor, picking up the kid’s toys, and generally anything else that requires bending over. Give it up and start squatting instead of bending over at the waist. Your back will thank you for it.